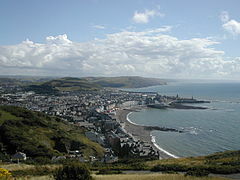 Cathair sa Bhreatain Bheag is ea Aberystwyth. Tá Ollscoil Aberystwyth agus Leabharlann Náisiunta na Breataine Bige suite sa chathair. Kronberg im Taunus, Hesse, An Ghearmáin. St-Brieuc, An Bhriotáin, An Fhrainc. Esquel, An Phatagóin, An Airgintín. Tugadh an leathanach seo cothrom le dáta an 10 Iúil 2017 ag 06:01.